This UVA high pressure system is the most powerful tanning system in the world. Special filter glass blocks out most UVB (burning rays) for a gentle golden brown tan. Get a great tan in 3-4 (12 minute) sessions. For even better results we recommend alternating Magic 636 sessions with the KBL 6800 and or the Dr. Muller Orbit and Sungate V-2. The open design of the worlds most powerful UVA high pressure vertical (stand-up) tanning system is great for claustrophobic clients. Special filter glass blocks out most UVB (burning rays) for a gentle golden brown tan. Get a great tan is 3-4 12 minute sessions. For even better results we recommend alternating Saturn sessions with the Cyclone vertical (stand-up) tanning system. The KBL 6800 features Intellisun Technology which allows the client to adjust the tanning system for the desired amount of UVA and UVB. Built in air conditioning, Aroma Therapy, Mist, auto volume control, USB audio, MP3 sound and adjustable facial tanning make this one of the most luxurious 10 minute indoor tanning experiences ever created. The KBL 5600 combines just the right amount of UVA and UVB for a golden brown tan. 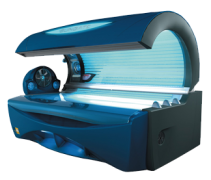 Enjoy a relaxing 12 minute or less bronzing time while enjoying the comfort of a contoured acrylic, built in a/c, voice instruction, and music system. This luxury addition has 52 VHR bulbs for the body, 4 UVA High Pressure bulbs for the face, and 2 High Pressure shoulder tanners. With built-in air conditioning, body misters, and aromatherapy you will be taken to a whole new dimension in indoor tanning. Our most popular tanning system gives you a quick and long-lasting tan. 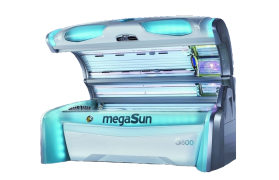 The 11,000 watts of gentle UVA and 2.0% UVB kick start your tanning experience with only 5-6 sessions. Then only 4-6 sessions a month help you maintain a wonderful, St. Trope tan without the need of a passport. 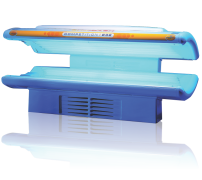 The Sun Capsule Eclipse is the most powerful vertical (stand-up) tanning system ever produced by Suncapsule and features 54 250 watt VHR lamps with only 2.0% UVB (burning ray) which provide a spectacular tan in only 7 minutes. A 21 mile per hour (mph) breeze keeps body cool and comfortable throughout your session. 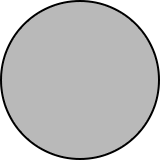 No tanning lines, perfect for filling hard-to-tan spots neglected by conventional tanning beds, 3-4 sessions per month are needed to maintain tan. Great for those sometimes hard to tan legs. Session time is 10 minutes and works even better when combined with sunless airbrush tanning. 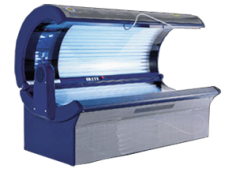 Our Bronze Level Santa Barbara UV Tanning System is designed to deliver an outstanding tan in a luxurious atmosphere with built-in body fan, stereo, and speakers. 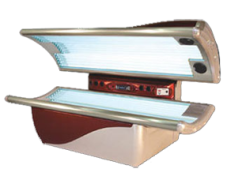 With 32 100-watt reflector lamps you will enjoy a larger tanning surface and more even tan.. Great for budget conscious tanners who want to tan in modern equipment at an affordable price. This tanning system is only available at our Thousand Oaks location. 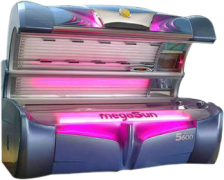 Our Bronze Level Sundash 232 UV Tanning System is designed to deliver an outstanding tan in 20 minutes or less. With 32 100-watt reflector lamps you will enjoy a larger tanning surface and more even tan. 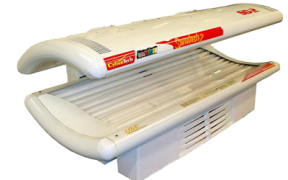 Great for budget conscious tanners who want to tan in modern equipment at an affordable price. This tanning system is only available at our Camarillo location. Tanning here has been the best experience I've ever had at any tanning place! Gary went over board to make my tanning experience great. The KBL Bed here is seriously Fantastic 2 times in that bed and the results are more than amazing !!! Really recommend this place to anyone in Ventura county you won't be sorry! Tanning here has been the best experience I've ever had at any tanning place! Gary went over board to make my tanning experience great. The KBL Bed here is seriously Fantastic 2 times in that bed and the results are more than amazing !!! 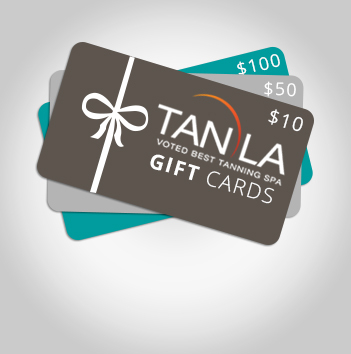 Really recommend this place to anyone in Ventura county you won't … Continue reading "Danielle H"
Great tanning salon, great equipment, always clean, people that work there are always helpful. Would not even consider another place to tan locally. I use the KBL beds which make you feel like you are hanging out at the beach. The tanning bed changes colors, plays lounge music, has an automatic mister, is air conditioned, and there are 3 levels of easy bake: basic, Mediterranean or Caribbean. I wanted to be Beyonce brown so I chose the caribbean setting and I have never been so dark from a tanning bed in my life. It was like I spent an hour in the caribbean when it was only 10 minutes in the KBL bed. I use the KBL beds which make you feel like you are hanging out at the beach. The tanning bed changes colors, plays lounge music, has an automatic mister, is air conditioned, and there are 3 levels of easy bake: basic, Mediterranean or Caribbean. I wanted to be Beyonce brown so I chose the caribbean … Continue reading "Mimi D"
Been coming here for a few years and the KBL bed ROCKS! They are so professional, friendly, and kind---and Shannon and her spray tans are the BEST!! She makes you feel at ease and completely comfortable. The place is ALWAYS SO CLEAN AND ORGANIZED. They've got it all for every kind of person and if you're new to tanning they will break everything down for you and show you what is best for you! Thank you guys, for all your pure professionalism and never making me feel silly for asking a questions about your beds and toning machines! Been coming here for a few years and the KBL bed ROCKS! They are so professional, friendly, and kind---and Shannon and her spray tans are the BEST!! She makes you feel at ease and completely comfortable. The place is ALWAYS SO CLEAN AND ORGANIZED. They've got it all for every kind of person and if … Continue reading "Audrey R"
Tan LA is the best!!! The guys that own it are both so awesome and are always here so I know I'll never have any issues and I'll always be greeted when I walk through the door 🙂 the second best thing about this place is their beds are amazing!! Even the standard bed gets … Continue reading "Laura L"
When tanning, if you're fair skinned like me, try the Magic tanning bed, it's amazing. If you're looking for the tropical paradise of tanning beds, you MUST try the KBL! Between the ambient lighting and the soothing music...all it's missing is the Mai Tai! It even has a mister built in. When tanning, if you're fair skinned like me, try the Magic tanning bed, it's amazing. 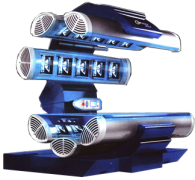 If you're looking for the tropical paradise of tanning beds, you MUST try the KBL! Between the ambient lighting and the soothing music...all it's missing is the Mai Tai! It even has a mister built in. MJ B. (Thousand Oaks, … Continue reading "MJ B"
They have a GREAT variety of lotions at great prices. And my favorite part . . . DRUMROLL PLEASE . . . they have a MAGIC bed!! Its the best thing ever and produces immediate, rich color. Its hands down one of my favorite beds. These are just a few of the reasons why they've been in T.O. for over 20 yrs and have great customer retention rates. They have a GREAT variety of lotions at great prices. And my favorite part . . . DRUMROLL PLEASE . . . they have a MAGIC bed!! Its the best thing ever and produces immediate, rich color. Its hands down one of my favorite beds. These are just a few of the reasons why they've … Continue reading "Melissa V"